A Madras Curry in a British Indian Curry House has become synonymous with a fiercely hot curry and not much else. Not my version which packs many more complex flavours but still keeps a punch of heat from chili and pepper. 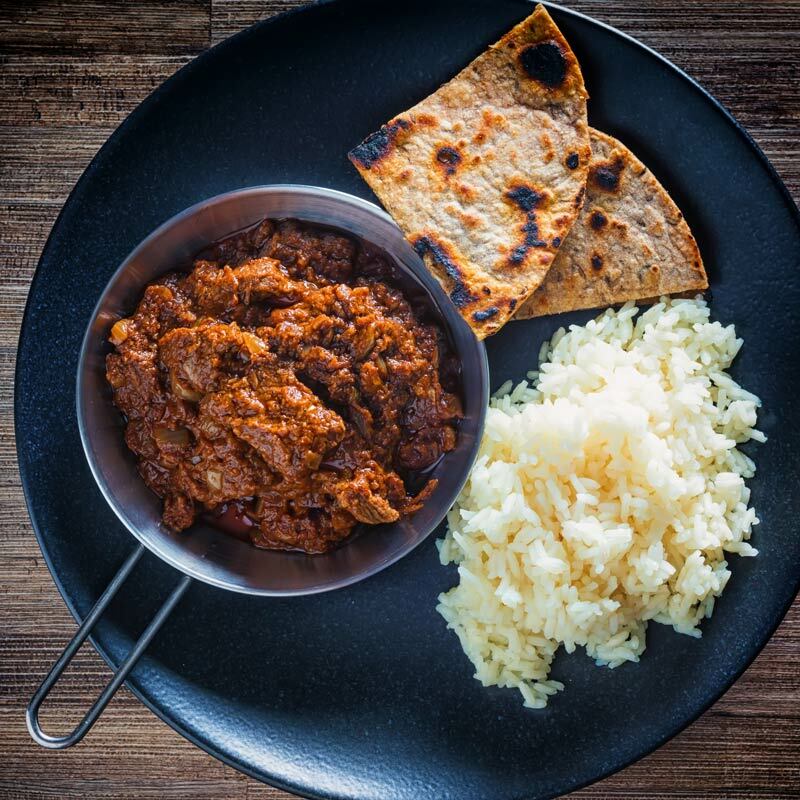 A Lamb Madras curry in the UK has a reputation for being somewhat of a one trick pony. A real fiery beast and not a lot else. However, my lamb Madras recipe has a little more about it. It certainly retains a fierce heat from both our own dried chilli (cayenne) and lots of black pepper. All of it tempered with coconut milk. Apparently, the Madras Curry name is not really used in India and it is a name that came from British restaurants. How true that is who knows? But the flavours seem to be very ‘South’ Indian and that ties in with the name. Madras being an old name for the City now called Chennai. How Hot Is a Madras Curry? Individual tolerance to spice from chili is so personal so this is a difficult question to answer. We can, however, look at it in terms of comparison to other curry recipes. A lamb madras would be considered a curry at the hotter end of the spectrum. On the spice scale, it typically sits between a jalfrezi curry and a vindaloo curry. If you do struggle with chili a great way to calm down the burn is bread. I would most definitely insist on a chapati to be served with this Madras curry! Me & British Indian Curry Recipes. I am not really all that interested in authenticity when it comes to food. I want food that makes me and more importantly my wife smile and this certainly does that. 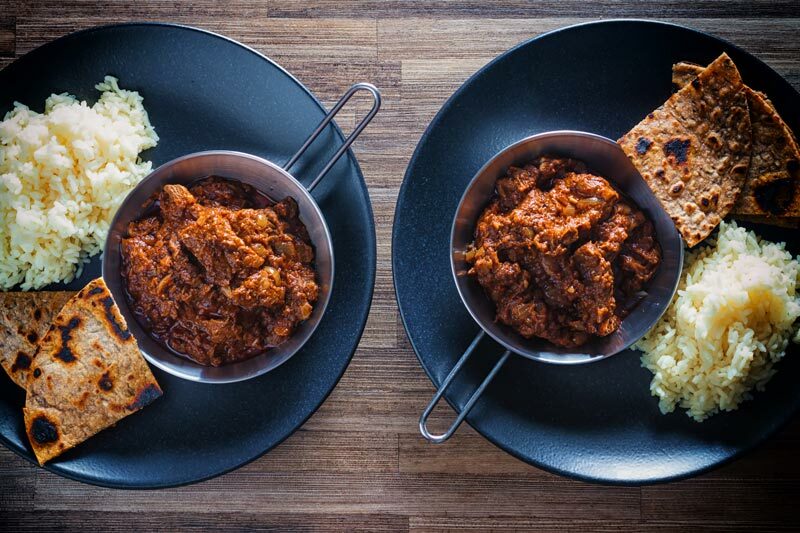 A British Indian curry makes no attempt at being an authentic Indian Curry. It is what it is, a recipe developed by migrants to a new country. Embracing both an older food history and what is available in their new home. I have to say as fully fledged migrant never have I understood British Indian food more than I do today! You should definitely check out a few of my favourites! It is not fusion food, it is a new food, filled with love for the past and curiosity of the present! 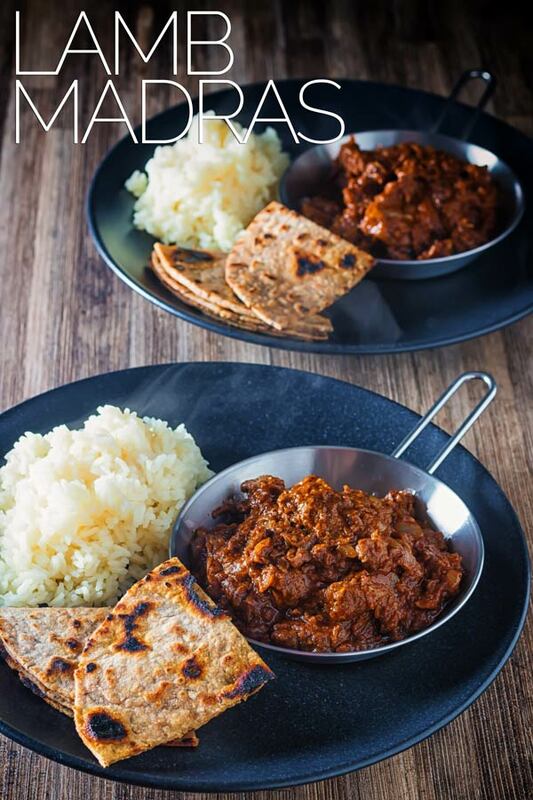 My lamb Madras curry recipe is actually a freezer meal that I have been ‘forced’ into cooking this weekend. Typically this would be because we are snowed in, this time we are ‘muddied’ in. Our wee little front wheel drive cars cannot cope with the sogginess of our road which really is just a dirt track. This Madras curry dish, however, is the perfect freezer dinner, all you need is a little lamb. The rest of the ingredients tend to be store cupboard ingredients. Well, they are for me and any other curry fiend anyway! A Madras Curry in a British Indian Curry House has become synonymous with a fiercely hot curry and not much else, my version has more complex flavours but still with a punch of heat from chili and pepper. Place the coriander seeds, peppercorns, fennel seeds, fenugreek seeds cloves and dried chili all in a dry pan over a medium high heat and toast until they become fragrant being careful not to burn. When the spices are toasted crush to a fine powder in a spice grinder or pestle and mortar and set aside. Add the oil to a medium frying pan over a medium high heat and cook the onion until they begin to colour which should take 5-6 minutes. Add in the garlic and ginger and cook for a further minute. Next add in the lamb and cook for 5 minutes stirring occasionally. Stir in the tomato puree, coconut milk, ground spices from step 3, salt and cover and allow to cook for 1 hour over a very low heat. After 1 hour remove the lid and reduce the remaining liquid to a thick paste. Remove from the heat and stir in the garam masala before serving. Serve with boiled rice and chapati and maybe a beer if you want the full British curry house experience. Wow this was soooooo delicious. Hot, yes, but that might e because I threw in an extra chilli or two. Best curry I’ve made in a long time. Thank you! Am going to try your other recipes without delay…. I was apprehensive over this dish at first because the spices can be overwhelming and not for the faint hearted. Needless to say, I doubled everything because I was feeding two men (American). They loved it and went for seconds; perspiring ofclurse. I (indian), on the other hand, was not even half way done with my first- I was the faint hearted one… BUT I can’t tell you enough how delicious this was. I want to make it again and I can’t wait to make Rogan Josh. Thank you for this brilliant, yet simple recipe. I am a huge ‘Hairy-biker Curry’ lover but a colleague put me onto this recipe and I have to say I am borderline addicted. So much so I am cooking after work – a rarity for me. Thank you very much for sharing, you have saved me from ‘after work takeaway syndrome’! 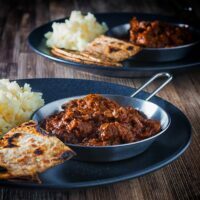 Just like to say what a superb recipe this is, absolutely Anglo-Indian and absolutely on the money. I’ve grown up eating curry throughout the Uk and this is reminiscent of any great restaurant or take away, real depth of flavour and a beautiful balance of spice. I love cooking all cuisines but find good Indian recipes hard to find, thanks for this one Mr Brian Jones ! I coupled with some nans made in the most unusual way (upside down in a pan) as authentic in result as the madras by a guy named h4ppyleader on YouTube. Fascinating method with great results, a perfect match to your curry. Brilliant curry, made it as a trial run for a curry night with friends. It tastes wonderful, so much flavour, not just heat but so authentic, well, better. 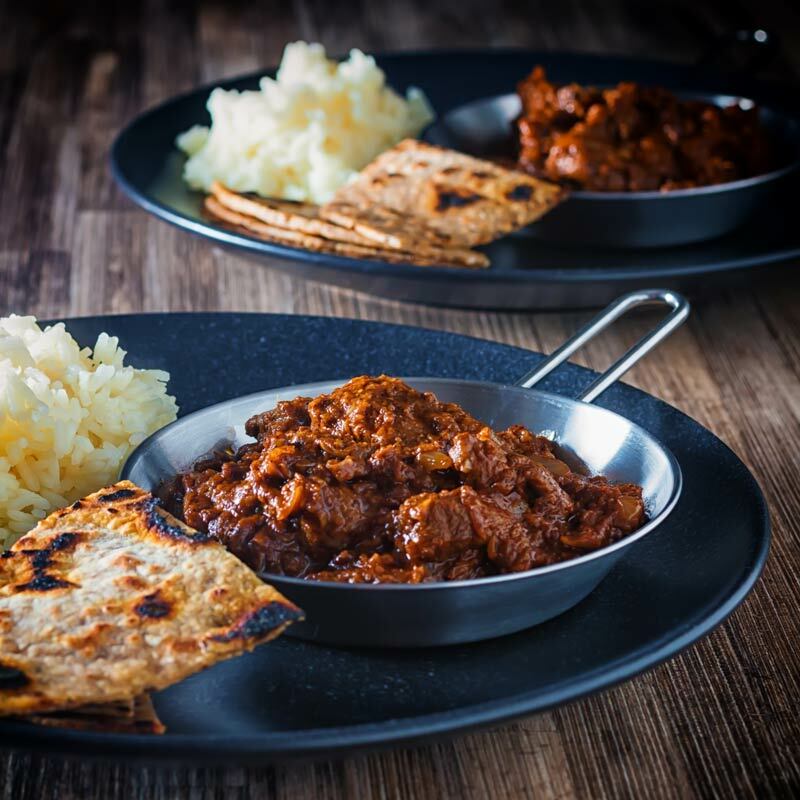 The meat tastes so good, you can even get the whole lamb flavour with spice without anyone flavour being too dominant, love, love, love this recipe and so will our guests. Just finished prepping and about to start cooking nut I’m unsure what I’m supposed to add on step 3? It’s probablys me being thick. Sorry John, it should read add onions, amended the recipe now… Thanks for bringing it to my attention. I think there’s too much emphasis on authenticity sometimes. This recipe both sounds and looks wonderful. The lighting is just beautiful! This looks incredible, Brian! Your Indian dishes always look so amazing! Thanks Whitney, I often find them challenging to photograph lets face it they taste great but often are pile of brown food which is always difficult to photograph. Brian, you really are such an inspiration to us food bloggers. Your recipes are gorgeous and your photography is simply amazing. Thanks for sharing another wonderful part of you. Cheers! My sister moved to Chennai this past summer — i’m dying for her to teach me some of the authentic dishes from the city/region. Haha, I am definitely an Anglo Indian Curry kinda chap, I have been to INdia and Pakistan but the food is a little different although still recognisable. Such a beautiful dish Brian! I must confess that I don’t eat lamb (my husband loves it! ), but I am a HUGE lover of curry 🙂 How do you think this would work with another meat? Maybe shredded beef or chicken? 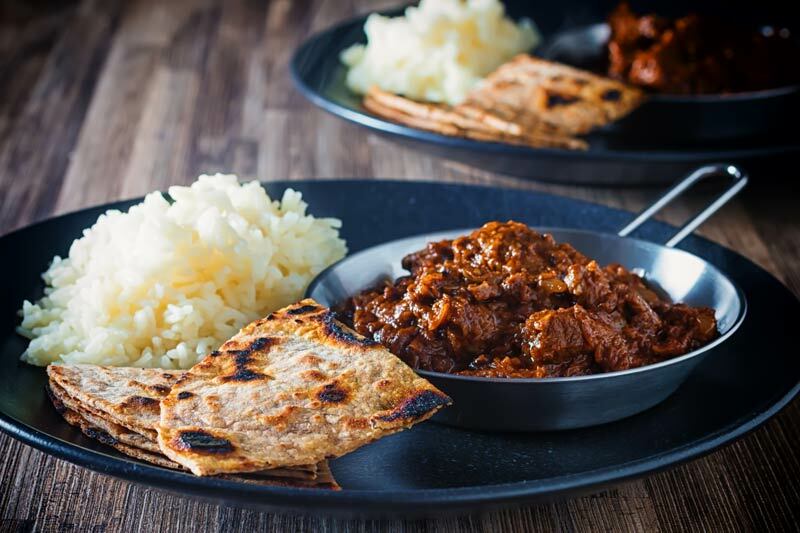 Dog food I get but do you need cash if you’re not going anywhere 😀 I am not a huge fan of lamb, given that I overdosed on mutton in my childhood, but this recipe had my mouth watering. I may have to forego my stance and make it. Haha, well one has to pay at the pub in some form, in all fairness she is happy to extend lines of credit but hey ho 😉 This dish works really well with a piece of beef that is good for stewing, think something like shin, it takes a little longer too cook and may need a splash of water to prevent it from drying out. I would loooove this dish. I love my food to be spicy and I adore curries!! Great recipe and photos. Curries are the BEST. I like your take on this one, especially with your own dried chillies – that’s awesome. Love the photos too, they turned out great. Brian what a fabulous looking madras curry. Nice and hot for those that like it that way, that would be me! And such a great photo. Couldn’t agree with you more – who cares how authentic the curry is when it tastes (and looks) that good!!! I love a madras but it does have to be more than just super hot chilli. This recipe sounds fab. Thanks for sharing. Gorgeous! Absolutely gorgeous! We’re lucky to have some of the world’s finest lamb on our doorstep (Shetland lamb!) and I have a freezer full of it. Pinned to try later!